Eames Armstrong (they/she) is an artist and curator who works with noise, interdisciplinary experimental performance, and queer theory. Eames received a BFA from the School of the Museum of Fine Arts, Boston in 2010 and an MFA from the George Washington University in 2016. They are currently based in Brooklyn and work out of a studio at Silent Barn, but maintain a long-distance relationship with the D.C. area. 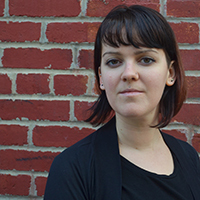 Margaret Ewing is Director of Programs at apexart in New York. A curator, art historian, and writer, her curatorial credits include recent exhibitions at The Museum of Modern Art, where she co-organized Kai Althoff: and then leave me to the common swifts, Pierre Huyghe: Untilled, The Forever Now: Contemporary Painting in an Atemporal World, and Carol Bove: The Equinox. Prior to joining MoMA, she contributed to the 2013 Triennial at the International Center of Photography and worked in Berlin as a research fellow and critic, writing for Artforum, among other publications. She holds a Ph.D. in Art History from the University of Illinois, where she completed her dissertation on Hans Haacke’s work on postwar German politics and identity. Cruz received a BFA in painting at Pratt Institute (1998) and an MFA from Yale University (2009). He attended Skowhegan School of Painting and Sculpture and completed the AIM Program at the Bronx Museum in 2006. Recent residencies include the LMCC Workspace and Project For Empty Space’s Social Impact Residency. Notable group exhibitions include El Museo del Barrio, BRIC, Performa 13, and the Smithsonian National Portrait Gallery. In 2013, Cruz was awarded fellowships with The Franklin Furnace Fund Award and The Urban Artist Initiative Award. Recent press includes The New York Times, Wall Street Journal, WhiteHot Magazine, W Magazine, Bomb Magazine, and El Centro Journal. Marco DaSilva is a native New Yorker whose symbol-based paintings explore hybridity through the intersections of his Brazilian-American, queer identity and manic experience. He has exhibited work at Apostrophe NYC, Heath Gallery, and the Samuel Dorsky Museum of Art. He is also a NYFA Artist as Entrepreneur Fellow. He lives and creates work at his studio in Bedford-Stuyvesant. Marco has a BFA in Painting and Drawing from SUNY New Paltz. Liz Collins is an artist known for her diverse work in textiles, and has over two decades moved fluidly between fields and formats including fashion, craft, performance, and design. Collins’ multi-media installations and textile works have been featured in museums and galleries internationally, including a long-term installation at the Tang Museum at Skidmore College in Saratoga Springs, as well as group exhibitions at ICA/Boston, the FIT Museum, Leslie-Lohman Museum of Gay and Lesbian Art, MoMA, and the New Museum, among many others. Federica Gianni (1986, Rome) is an Italian filmmaker based in New York. She has made short films in the U.S. and Europe. Her work explores the different expressions of contemporary masculinity, and focuses on the struggle between belonging and otherness. The short film "The Friend from Tel Aviv" screened in major LGBT film festivals in the U.S. and internationally, and won the DGA Award for "Best Student Film" in the women's category. Her latest short film "Primo" won the Adrienne Shelly Foundation Award for "Best Female Director" at the 30th Columbia University Film Festival. Federica is currently developing her first feature film "To the Moon On the Wings of a Pig" set in Rome. Rose Troche is a writer/director/producer of film, television and new media. Her career began with her debut feature, Go Fish, which premiered at the Sundance Film Festival in 1994. She has continued to work in film, television, and most recently Virtual Reality with three back to back debuts at Sundance (2015-17). Lucas Habte is an Ethiopian-American filmmaker living in New York City. After studying documentary at Harvard, Habte received the George Peabody Gardner Traveling Fellowship to work as a video and radio facilitator with Aboriginal people in the remote communities of the Australian outback. In 2014, he was awarded the Mortimer Hays-Brandeis Traveling Fellowship to Ethiopia, where shot his first feature documentary, Shadow of His Wings. He is a 2017 Film Independent, TFI Network, and IFP Fellow. Ryan J. Haddad is an actor, writer, and autobiographical performer based in New York. His debut solo play Hi, Are You Single? was most recently presented in The Public Theater’s Under the Radar Festival. Hi, Are You Single? subsequently received workshops at Dixon Place, Williamstown Theatre Festival, and the LGBT Center of New York City under the direction of Laura Savia. Moe Angelos is one of The Five Lesbian Brothers, who have written, performed and published six plays and other things that the Internet can tell you all about. Moe has collaborated with the Builders Association as a performer and writer since 2000 and is now touring with The Builders’ show, Elements of Oz. She has been involved with the WOW Café forever and has appeared in the work of many downtown luminaries including Carmelita Tropicana, Anne Bogart, Holly Hughes, Lois Weaver, Kate Stafford, Brooke O’Harra, Half Straddle, and The Ridiculous Theatrical Company. To hear more, visit The Made Here Project and browse the artists. Lamya Haq is a queer Muslim writer living in New York City. Her work has appeared in Salon, VICE, Vox, Black Girl Dangerous, Autostraddle, and others. She was a Lambda Literary Fellow in 2015 and an Aspen Words Emerging Writers Fellow in 2016. At 14, Jarrett Key was a “scholarship kid” from rural Alabama, attending a predominantly white high school in Georgia. At 18, Key left the south to attend Brown University. Since moving to New York, Key has been featured in performances, biennales, residencies, publications, exhibitions, and workshops at NYU Tisch, and galleries in Brooklyn, Chelsea, LES, Harlem, Boston, Ljubljana and Shanghai. Key’s work is in the collections of the Schomburg Center, MoMa Library, and The Metropolitan Museum of Art Library, among other institutions. Key's HAIR PAINTING series has been featured at the Studio Museum in Harlem and Harlem Arts Festival in Marcus Garvey Park, as well on television: SLAY TV, and CBS 2 NYC. Madsen Minax makes films, videos, and multi-disciplinary projects inspired by the collective and individual politics of belonging, and considers where fantasy, desire and embodiment interfere. Hiz works have shown at Anthology Film Archives (NYC), Museum of Contemporary Art (Chicago), REDCAT (LA), the Museum of Fine Arts Houston, the British Film Institute (UK), the European Media Art Festival (Germany) and numerous film and video festivals around the world. Madsen received an MFA from Northwestern University (2012), a BFA from the School of the Art Institute of Chicago (2005), and has attended residencies at the Skowhegan School of Painting and Sculpture (2014), The Core Program (2012-2014), Bemis Center for Contemporary Art (2015), and the Berlinale DOC Station (2016). Kimberly Reed is a documentary filmmaker, who produced and directed the landmark Prodigal Sons. The film garnered 14 Audience and Jury awards and landed on numerous “Best of the Year” lists after a successful theatrical run. A co-production with BBC Storyville and Sundance Channel, it is considered one of the most influential films to tell a story of transgender evolution and acceptance. Reed was recognized as The Advocate's “Five to Watch,” and OUT Magazine's “Out 100.” She was also the producer/editor/writer for the documentary Paul Goodman Changed My Life, released theatrically by Zeitgeist Films, and a producer of The Death and Life of Marsha P. Johnson. Filmmaker Magazine named her one of “25 New Faces of Independent Film.” Reed is also a well-regarded writer. Zoe Schlacter is an interdisciplinary artist and designer living and working in Brooklyn, New York. Through writing, textile making, and performances of personal style, Schlacter’s work creates a queer intersection of textiles, gender, and intimacy. Schlacter’s work and personal style has been featured in Teen Vogue, BUST Magazine, Vogue Spain, Vogue Taiwan, and Metropolis Magazine. In 2016, Schlacter received grant funding for an apparel-based, collaborative research project, which explores the aesthetic possibilities of a femme future. Schlacter received a BFA in Textiles from the Rhode Island School of Design in 2017.